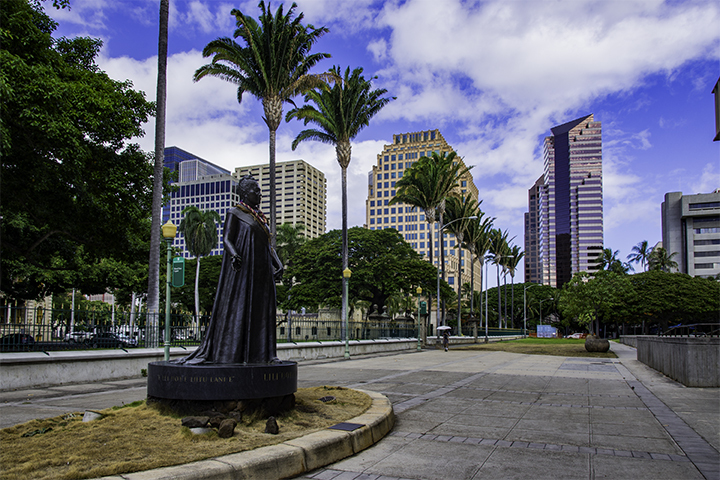 Statue of King Kamehameha in front of Ali’iolani Hale, one of the great heroes of Hawaii. Who Are the Heroes of Hawaii? Hawaii is more than just a picturesque vacation destination. It is also home to many honorable, courageous and talented men and women. Here are some of the greatest heroes of Hawaii. This great Hawaiian king was famous his determination and success as a monarch. Kamehameha was aa strong warrior, able to overturn stones weighing thousands of pounds. He was also skilled in lua, the Hawaiian martial arts of hand-to-hand combat. He led his warriors to victory in bloody battles, such as in Nu’uanu Pali and Iao Valley. Kamehameha employed western war tactic and weapons to unite the Hawaiian Islands under his rule in 1810. 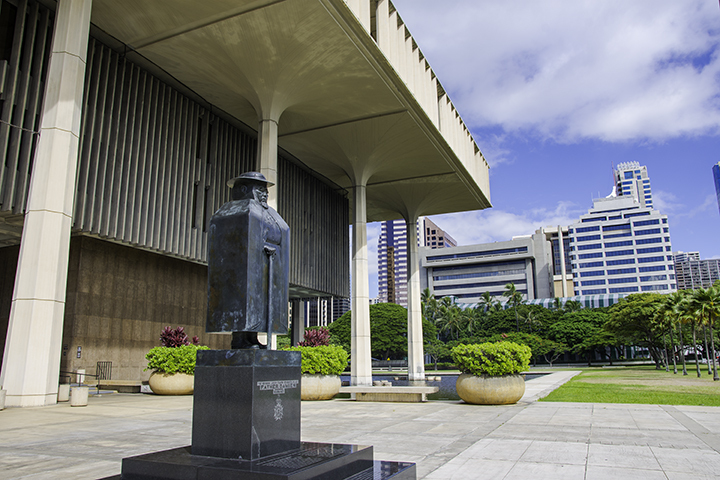 There are statues commemorating his influential rule over Hawaii in four different places. 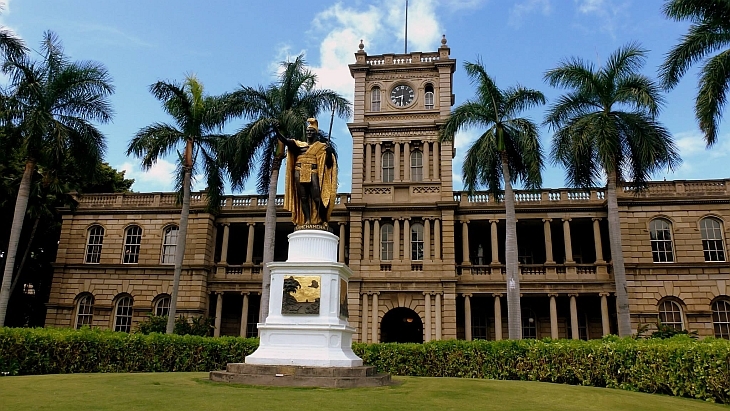 They include Hilo and North Kohala on the Big Island, Honolulu on Oahu and at the National Statuary Hall in Washington D.C. Hawaii honors its king by decorating his statue with leis on Kamehameha Day on June 11 each year. The legendary king is probably one of the most famous heroes of Hawaii. A pillar of Hawaiian strength and agility, Duke Kahanamoku was famous for his swimming abilities. He won numerous distinctions and medals in his lifetime. Duke was a record-breaking swimmer and winner of multiple gold medals in the Olympic Games. Duke taught many how to surf, canoe and swim, becoming Waikiki’s most famous beach boy. He was later became Honolulu’s sheriff. One can see his name in both the Swimming Hall of Fame and the Surfing Hall of Fame. 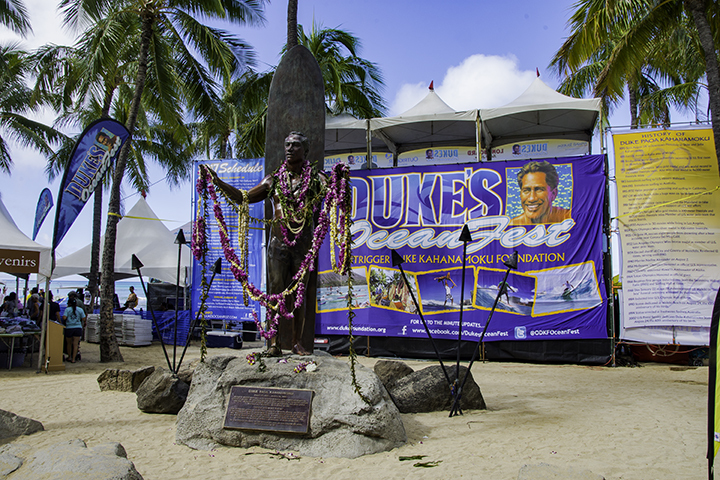 On Kuhio Beach in Waikiki, a statue of the “Father of Surfing” honors Duke Kahanamoku’s life. Statue of Father Damien in downtown Honolulu. Father Damien came from Belgium to serve in the infamous leper colony on Molokai in the late 18oos. He brought order and structure to the lives of those suffering with Hansen’s disease or leprosy. He comforted them in their pain and taught them about hope and faith in the midst of suffering. Well-loved by all, Damien served selflessly for 16 years before he lost his life to the disease. Father Damien became Hawaii’s first person to be canonized as a saint by the Catholic Church in 2009. His heroism and service is appreciated by all in Hawaii, dedicating two statues to his memory. One is in St. Joseph’s Church on Molokai and the other is at the State Capitol building in Honolulu. Catholic nun Marianne Cope arrived in Hawaii at the request of King Kalakaua to oversee the Branch Hospital on Oahu. She successfully established the Oahu Hospital and the Malulani Hospital in Maui. She also started a girl’s home in 1885 for those separated from parents with leprosy. Mother Marianne Cope then moved to Molokai with a few courageous sisters in 1888. They came to carry on Father Damien’s work and to care for him, just months before his passing. Cope brought joy to the residents of Kalaupapa. She would sing and play the piano and teach children. For her selfless work and devotion to many, including those with Hansen’s disease, she was declared a saint in 2012. People called her by her name, Lydia Kamakaeha, before she became Hawaii’s first reigning queen. Hawaii remembers her as the last sovereign to govern the islands before annexation by the United States in 1898. Lili’uokalani regretted the power the monarchy had lost under her predecessor, King Kalakaua. As a result, she tried to restore the authority of the Hawaiian monarchy. This made her the target of powerful foreigners who wanted to expand their businesses in Hawaii. To avoid bloodshed, Lili’uokalani surrendered her throne in 1895 to insurrectionists led by American Sanford B. Dole. The Army formed the 100th Batallion in Hawaii after the bombing of Pearl Harbor by Japan in 1941. In it, Americans of Japanese ancestry from Hawaii proved their loyalty at a time when it was in question. Ironically during this time, the US government interned Japanese-Americans on the mainland in concentration camps. Later, the 100th Battalion merged with the 442nd regiment, also mostly comprised of Japanese-Americans. The 100th Battalion/442nd Regimental Combat Team fought throughout Europe and was quietly famous for its fierceness and bravery. The unit had the highest casualty rate and received the most decorations in the history of American warfare. Twenty-one of its members, including the late US Senator Daniel K. Inouye, were Congressional Medal of Honor awardees. Its heroic contributions during World War II were one of the factors paving the way for Hawaii’s statehood in 1959. To many today, the veterans of this group are the most impressive contemporary heroes of Hawaii. Ellison Onizuka came from the small, remote town of Kealakekua on the Big Island of Hawaii. Here, he grew up to become a flight engineer and test pilot for the United States Air Force. In 1978, NASA selected Onizuka as an astronaut. He was Hawaii’s first astronaut as well as the first Asian American and first of Japanese ancestry to enter space. He was a Mission Specialist on Space Shuttle Discovery. Onizuka was also on the last flight of the Space Shuttle Challenger. But sadly, the spacecraft tragically exploded after launch from the Kennedy Space Center, with all hands lost, in 1986. Ellison Onizuka has been the recipient of numerous posthumous awards such as the the Congressional Space Medal of Honor. Numerous streets and buildings also bear his name in Hawaii and across the nation. Ellison Onizuka is one of the great heroes of Hawaii and continues to be an inspiration to all.